Hopefully most, if not all, of my loyal readers are those who have concerns when it comes to investing in a new post frame building (I do know some of you just enjoy my slightly skewed sense of humor, or find my writings otherwise entertaining). For those of you who are avid kit shoppers, I try to give honest advice to any question posed to me. “Hello, I’m shopping around potential kit purchases and have a few questions. First off I’m planning to finish the interior, are the long spans between trusses you design able to handle the dead weight of drywall ceilings? One of my main concerns is column rot as my area is fairly wet. What type of treatment is used on the columns, where do you source them from, and do you ever recommend concrete permacolumns? Is it possible to use half scissor trusses and half regular to gain extra height in only certain areas? 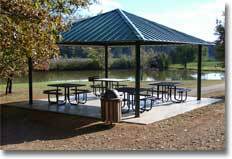 Yes, we are able to design roof systems to support virtually any dead weight – including gypsum wallboard (drywall). 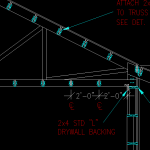 Whether a Hansen Pole Building, or not, it is just a matter of the proper loads being applied in the engineering design phase of the truss process, then (if the trusses are spaced over two feet on center) using appropriate framing between the bottom chords of the trusses to support the loads without undue deflection. If you intend to insulate above the ceiling, make sure to ask for the trusses to be designed with a raised heel at least two inches higher than the depth of the ceiling insulation, to allow for full thickness of the insulation above the sidewalls. Normally this has little effect upon the price of the trusses, however the building must be made taller to provide the same interior clear height. All Hansen Pole Buildings’ structural columns (supporting roof loads) are pressure preservative treated to a minimum UC-4B specification, which is the requirement per the IBC (International Building Code). Even under extreme conditions, these columns should more than adequately support your building not only for your lifespan, but also your grandchildren’s. 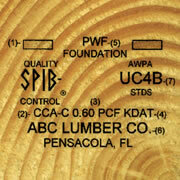 The longevity of properly pressure preservative treated lumber has been well documented in scientific testing. We’ve had clients use concrete permacolumns – if your concern is properly pressure preservative treated wood not being adequate for your situation, a less expensive (and easier to build) alternative would be to pour the column holes full of concrete and utilize wet set brackets. It is possible to mix any combination of scissored and flat bottom chord trusses throughout your new post frame building to gain extra height or for aesthetic purposes. This entry was posted in Pole Barn Questions, Pole Barn Design, Pole Barn Planning, Pole Barn Structure, Trusses, Building Interior, Columns and tagged scissor trusses, drywall, UC-4B, permacolumns on May 29, 2018 by admin. DEAR NORMA: Despite what might be voiced by naysayers – properly pressure preservative treated lumber should, under most circumstances, last longer than you and I (or our grandchildren) will be around to see. If you are curious, excavate the top eight to 12 inches of soil around one or more of the columns and check on the condition of them. We are currently adding onto our warehouse – a 40 year old post frame building. 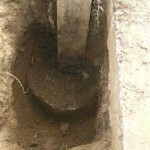 Some of the existing columns were dug alongside and it was determined there had been no noticeable decay at all. I would suspect yours will be the same. DEAR TOM: I will do what I feel is some interpreting….where “joists” are the prefabricated metal connector plated wood roof trusses, and “strap” would refer to framing placed across (or more probably between) the bottom chords of the trusses. If your trusses have been designed to support the weight of a ceiling load, then yes. Hansen Pole Buildings uses a 10 psf (pounds per square foot) design ceiling load for instances where gypsum wallboard will be applied. A five psf load might possibly be adequate with bare minimal framing and nothing ancillary hanging from the bottoms of the trusses. You would be well advised to consult with the engineer who designed your building, or the truss fabricator to insure your roof system is indeed adequate to support these loads. Once truss adequacy is confirmed your engineer can specify the size, species and grade of the material to be used as ceiling joists as well as what he or she requires as a connection between the ceiling joists and the trusses. DEAR GLENN: Hansen Pole Buildings now supplies (as a standard feature) one or more UP-Lift plates per each structural column (the required number will depend upon analysis by the Engineer of Record). 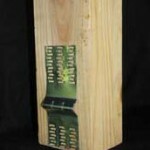 It would require a significant number of large diameter nails to equal the holding power of a single UP-Lift plate. Rebar through the column might prove to be adequate, however it does involve a significant amount of effort to drill the holes through the column, cut rebar to short lengths and seal the rebar at the edges of the column to prevent water infiltration. In any case, the ultimate responsibility for design of adequate uplift resistance should be left up to the engineer who designs your building. This entry was posted in Lumber, Pole Barn Structure, Trusses, Columns and tagged pressure treated posts, drywall, column uplift protection, Rotting, Ceiling loads, Uplift Plates on October 21, 2017 by admin. Drywall Idea, Bolt Counts? and Don’t D-I-Y This! 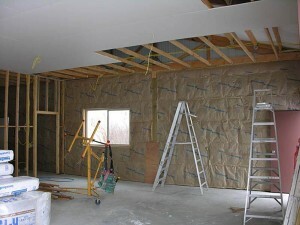 DEAR JAMES: Provided you have a good building wrap between the siding and the wall girts (read more about building wraps here: https://www.hansenpolebuildings.com/2012/11/house-wrap/), as well as a well-sealed vapor barrier between the girts and the drywall, you should be able to minimize the effects of moisture in the wall. Now your bad news. I will take a wild guess and surmise your post frame building has girts nailed flat on the outside of the columns. If so, and you attempt to drywall to the inside face of the girts, be prepared for infinite issues with the drywall joints cracking due to excess deflection. If there is no building wrap, a quick and easy fix is to have an inch or more of closed cell foam insulation sprayed on the inside of the siding. I’d most probably either build a vertical stud wall between the columns, or place another set of horizontal girts on the inside of the columns. Either of these would afford an insulation cavity with enough depth to make a difference. 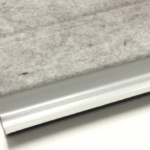 This would allow BIBs insulation to be blown into the wall with a minimal number of heat transfer points. 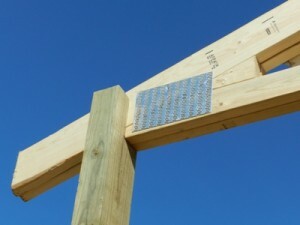 DEAR POLE BARN GURU: How many lag bolts should be used in a 4 x 6? This is for the truss supports. COREY in PAW PAW. DEAR COREY: My educated wild guess is your post frame building has trusses placed on top of a truss carrier (basically a header from column to column). You can find the size and number of required fasteners by looking at the data prepared by the engineer who designed your building, as this information will be on the sealed plans. Numerous factors would be involved in the determination of adequate fastening. If the carriers are notched into the columns, far fewer fasteners will be required, as they will only be needed to resist wind loads. If the carriers are placed on the sides of the columns, then the roof load is typically the governing factor. The fasteners then have to resist the live loads (snow and any attic bonus or storage space) plus the dead loads (weight of roof system and covering, as well as any ceiling. The spacing of the columns and span of the truss impact the number of fasteners as well. 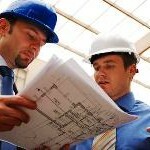 If for some reason this information is lost or missing from your plans, a competent local RDP (Registered Design Professional) should be engaged to provide a connection design for you, as this is hugely critical to prevent unexpected failures which could result in bodily harm or death. DO NOT GUESS. DEAR LARRY: I hate to just throw out the obvious, but in your case I will – DO NOT BUILD YOUR OWN TRUSS. Prefabricated metal connector plated wood trusses are nothing short of an engineered miracle. You can have them designed to support any load which you can conceive of, have them delivered to your site and engineer sealed drawings are provided to confirm the required load conditions are met. A quick Google search of “Tyler Texas Wood Roof Trusses” will give you several possibilities to discuss your needs. This entry was posted in Insulation, Pole Barn Structure, Trusses, Ventilation, Building Interior, Fasteners and tagged girts, drywall, exposed poles, deflection, bolts count, truss assembly on July 15, 2017 by admin. DEAR VAN: Bookshelf girts for insulation (e.g. 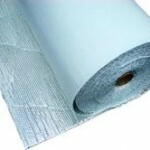 Commercial Girts) is a quick and easy way to create a deep insulation cavity as well as providing the framing for your interior GWB (Gypsum Wall Board). You will want to confirm your new post frame building frame is stiff enough to prevent undue deflection from cracking the GWB joints. 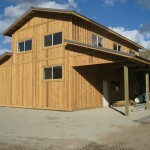 Learn more about commercial girts here: https://www.hansenpolebuildings.com/2011/09/commercial-girts-what-are-they/. DEAR MIKE: You can build any sort of post frame building on your site which will be allowable under the limitations of your Planning Department. As to dealing with the flood issues, you should have your property elevations determined by a surveyor, and the site where the building will be constructed can then be built up so the floor will be above the flood plain level. DEAR BRANDON: While it would be easy to install the steel roofing without having to place the reflective radiant barrier between the roof purlins and the roof steel, it is going to be the easiest method to limit condensation issues, given the product you have invested in. Hopefully you have gotten the double bubble with a tab along one side and an adhesive pull strip, otherwise you will have to tape all of the seams as you work your way along the roof. Could you place it on the underside of the purlins? Yes, however in order to work as an effective condensation control, it has to be absolutely tightly sealed against any protruding framing members. Remember the time you saved on installing the roof steel? You just ate it all up. If you have not yet ordered your steel roofing you could resell the reflective radiant barrier online and order steel with I.C.C. (Integral Condensation Control) attached (see the article and video here: https://www.hansenpolebuildings.com/2017/03/integral-condensation-control/). This entry was posted in Uncategorized, Insulation, Steel Roofing & Siding, Building Interior, Pole Barn Homes and tagged condensation, girts, drywall, Condenstop, elevations, site prep on May 8, 2017 by admin. How Can I Add interior Walls to a Post Frame Building? 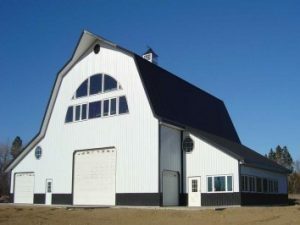 DEAR PATRICIA: The beauty of post frame (pole barn) buildings is the great majority of them are designed to be clearspan – there are rarely interior columns to avoid, so non-structural interior walls can be placed anywhere! This was a great feature for my lovely bride and I, as we moved walls all around until we came up with the configuration which best met with our needs – after the building shell was completed. There is a caveat – if the interior of your building is going to have gypsum drywall (aka sheetrock) it is important to have the structure designed to limit the deflection. Most post frame buildings are designed with only the deflection of steel siding in mind, which would cause many drywall joints to crack under wind or seismic events. If properly designed (better make sure an engineer was involved in those original plans) then no materials should have to be added to the exterior framework in order to add interior walls. 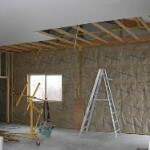 You will, of course, have to provide the materials for the interior walls themselves. DEAR POLE BARN GURU: I am doing a barn w apartment , the whole building will be conditioned space, I am looking for the best house wrap for my barn and new home? DEAR DANIEL: Most Building Permit issuing jurisdictions are going to require a Weather Resistant Barrier underneath siding around a conditioned space, so there is probably not much of a choice. For the most part, concrete lap siding should be installed over a solid sheathing such as OSB (oriented strand board) or plywood to prevent waves in the material and to give the building adequate shear resistance. Here is the link to the first of a three part series of articles I wrote on Weather Resistant Barriers: https://www.hansenpolebuildings.com/2016/01/determining-the-most-effective-building-weather-resistant-barrier-part-1/. This entry was posted in Insulation, Pole Barn Design, Building Styles and Designs, Pole Barn Planning, Steel Roofing & Siding, Alternate Siding, Building Interior and tagged house wrap, drywall, Roof Only, design, interior walls, picnic shelter, weather resistant barriers on February 13, 2017 by admin. If it is weird, strange or otherwise just bizarre, when it comes to pole buildings, chances are it will eventually come across my desk. Otherwise I would have run out of material to write articles about a long, long time ago. And it is rewarding to know I’ve got lots of loyal readers – like my friend Vincent….when technology failed last week and an article wasn’t up right away one day last week, he let me know how saddened he was, as he reads them every day at lunch!! We have clients who are constructing two fairly good sized buildings for the growing of green leafy substances which are entirely legal (although highly regulated) in two states currently – Colorado and Washington. The buildings were ordered with framing to support steel wall liner panels, so evenly spaced up the walls, the girts are every 34-1/8 inches on center. All well and good, for steel. However, the clients have now determined they would like to have gypsum board drywall (aka sheetrock) on the inside of the exterior walls. It appears this decision may be due in part to their Building Official deciding the Building Occupancy Classification F-1 structures are somehow not allowed to have steel liner panels over insulation….we’re awaiting the section of the Code (2012 International Building Code) which would have this stipulation, as currently we have been unable to find it. The determiner on whether gypsum board will work in any given application is going to be deflection. IBC TABLE 1604.3 DEFLECTION LIMITS addresses the allowable deflection as “l” – the distance being spanned divided by a given unit of acceptable deflection. 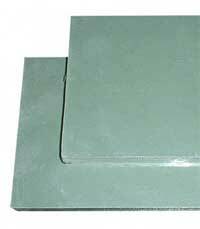 For exterior walls with flexible finish (such as gypsum drywall) under a wind load, this limitation is l/120. And from Footnote “f” of the table, “The wind load is permitted to be taken as 0.42 times the “component and cladding” loads for the purpose of determining deflection limits herein. The Vult design wind speed for this structure is 110 mph (miles per hour). The net lateral pressures on the walls are greatest in Surface 1E (near the corners) of 17.697 psf (pounds per square foot), with a components and cladding wind pressure of -19.6 psf. 19.6 psf X 0.42 = 8.232 psf. I called the good folks at USG (United States Gypsum – www.usg.com) to get their take on whether their 5/8” thick Sheetrock™ would span the 34-1/8” on center spacing of the wood framing without undue deflection. Being it was late on a Friday afternoon, the feedback was limited in its scope, however, they did email me the “Gypsum Association Properties of Gypsum Board”, which turns out to have some useful information. On Page 3 of 5 of the document copyrighted by the Gypsum Association is a table for “Negative Wind Load Resistance”. For ½” thickness over wood framing at 16 inches on center the allowable load is 80 psf, for 5/8”130 psf. Allowable deflection is based upon the span^4. This makes the deflection at 2.84375 feet (34-1/8”) 20.692 times the deflection of 1.333 feet (16”). Using 130 psf / 20.692 results in a maximum psf of 6.28 which is less than the calculated 8.232, so 5/8” gypsum drywall would not be an adequate design solution. Under these load conditions, the maximum span of the 5/8” gypsum drywall would be 31.9”. 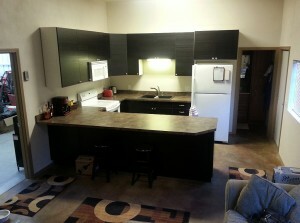 What about ½” drywall over 24 inch on center supports? The deflection at 24 inches on center is 5.0625 times the deflection at 16 inches. 80 / 5.0625 = 15.8 psf, which would prove adequate given these loads. This entry was posted in Uncategorized and tagged Building Code, deflection limits, drywall, gypsum board deflection, Sheetrock, wall framing spacing on June 5, 2015 by admin.